I Buy Way Too Many Records Dot Com: Winter Bear - Jump In The Fire 7"
A little bit ago I got a package in the mail from Hozac, which was interesting as I hadn't placed an order with them recently. Imagine my surprise to find out they had sent me a stack or records to review. It wasn't the most recent batch of releases they've put out, but a cross section of records that they've released over a last few years. I'm certainly game for that, so the first I'll tackle is Winter Bear. Something that struck me as kind of funny is that as soon as I saw this record, I had an idea of what I thought it would sound like already in my head, and it turns out I was exactly right. I don't think that is because I'm some sort of savant or anything, but I think it speaks more to how Winter Bear just has an aesthetic down for all aspects of their music, including the artwork. I dig the artwork and I dig the two songs. I feel like eventually someone is going to hunt me down and beat me in the head for continually comparing bands to Baby Shakes, but I really feel that they are my touchstone for the sort of high energy, 60's throwback, female fronted bands that I tend to enjoy the most. Winter Bear has this in spades from the lightly fuzzed out guitar, upbeat rhythm section and the well placed "shoo-wah-wah" in the A-side "Jump in the Fire." B-side "Should I Leave" is just as strong. It has a slightly more jangly guitar sound, but captures the same sort of magic in the vocals. 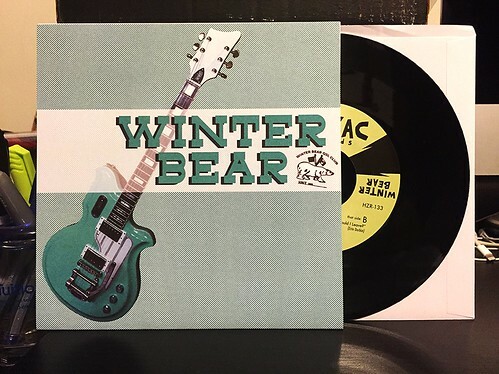 This record came out back in 2013, and it looks like Winter Bear only put out one other 7" since then. I'll probably pick that up at some point as this record is so good. I'm not sure if Winter Bear is still kicking around, but I hope they are, this is pretty great stuff.